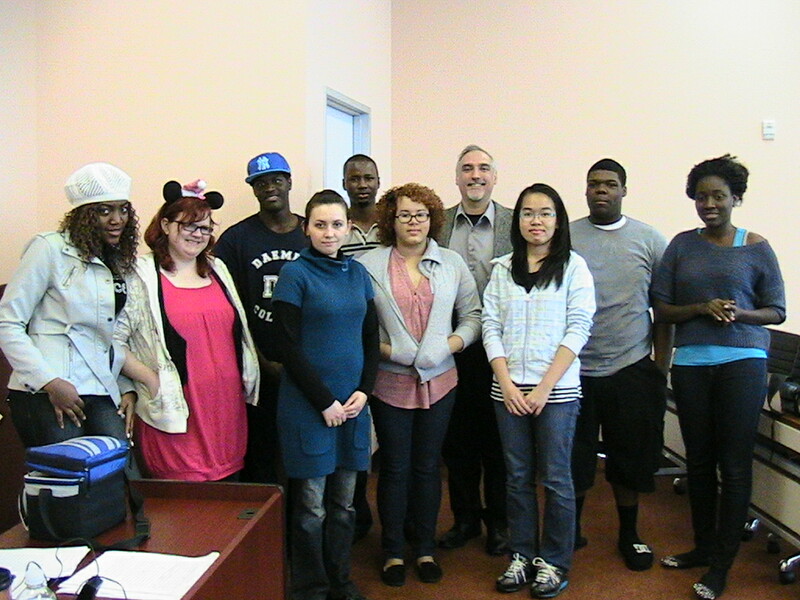 Lawrence J. Clark’s classes at North American College, Fall 2011! Greetings, and Merry Day After Christmas! This blog is usually devoted to my school and library programs, but I had so much fun teaching my students at North American College this semester that I just had to share! North American College is a brand new 4-year college located in Houston, Texas. North American College, as an institution of higher learning, is committed to providing a nurturing environment for the systematic pursuit of academic and career-related learning, professional and personal development, responsible citizenship, and global cultural competency. The college aims to achieve these goals through instruction, scholarly inquiry, the free discussion and dissemination of ideas, and creative activity. The following core values should guide all members of the college community as they strive to achieve individual and joint goals. Learning – Dedication to the discovery, construction, discussion and dissemination of knowledge and its real-world applications. Honesty and Integrity – Commitment to truth and consistency in one’s actions and communication. Leadership – Courage and commitment to lead with integrity, innovation and openness to new ways of thinking and inquiry. Teamwork – Pursuit of excellence through consultation and collaboration. Ethical and Professional Conduct – Pursuit of high ethical and professional standards in every endeavor. Human Dignity – Recognition that every human being is unique and valuable, and has something of value to contribute to the college environment and society at large. See you next time, and remember that reading is your key to success!